Some years ago, like ten, after Barry Beck told me in a conversation that the Orvis Flexi-Floss floats, as compared to Wapsi Spanflex that sinks, and being latex, rots after a few years, I began using the Flexi-Floss, a spandex product made by DuPont, for a smooth, quill-body substitute in a number of mayfly dry fly patterns. I figured it was a great substitute for natural quill materials, due to its ease of use and wide range of colors. Indeed, it is. Barry also told me you can split the material, using a bodkin. I have tied small drys with this material, down to #22 Blue-wing Olive patterns using this technique. As I tied more patterns with this material, I also learned that it is very translucent, even the darker colors. It is very much susceptible to changing of shading depending on what color of thread is used underneath. For example, the tan Flexi-Floss makes a great female or Light Hendrickson pattern when wrapped over the pink 8/0 Uni-Thread. 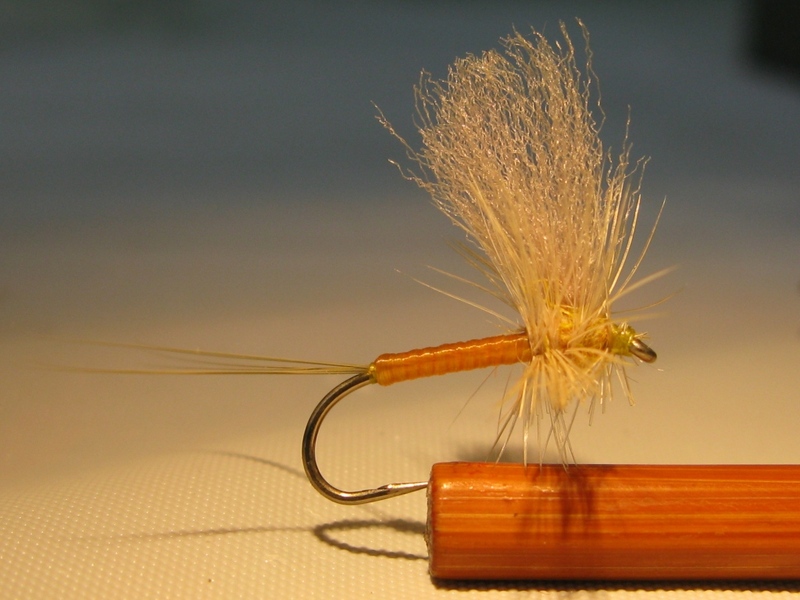 The same color of Flexi-Floss makes a great body for the Male Hendrickson when wound over Danville’s Flymaster 6/0 No. 47 Tobacco Brown. I had quill-bodied – made with Flexi-Floss Comparaduns and Thorax Dun Female Hendrickson patterns on display this past show season, and people at the shows went ga-ga over them. How did I get that beautiful pinkish-tan color? Yup. Tan Flexi-Floss wound over the pink thread. Hence, there is an almost unlimited range of possibilities for colors of may fly bodies when using this DuPont product. The MFC amber is what I would use for sulphur orange. #14 Sulphur Sexi-Floss Thorax Dun, tied and photographed by Don Bastian. 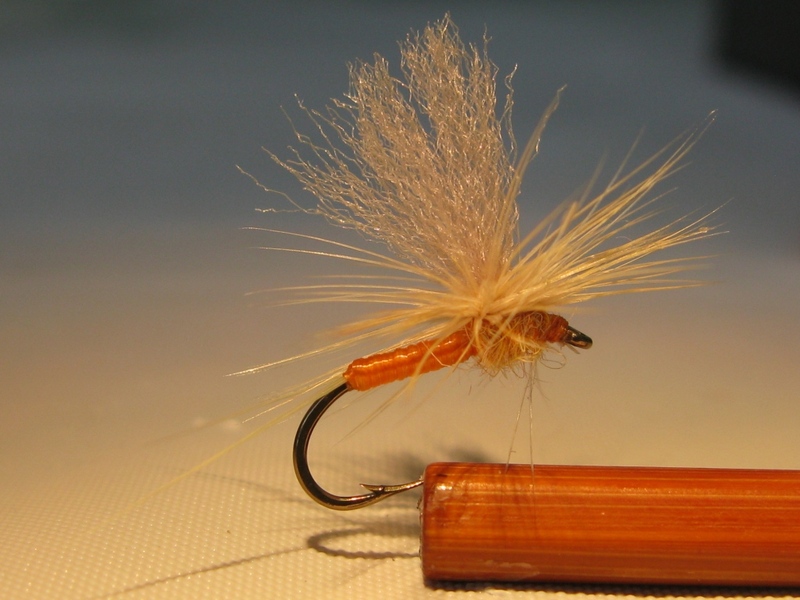 That’s what I decided to call this fly (for now), because I know that Montana Fly Company still sells this product. Sexi-Floss ordering information from Montana Fly Company Dealer, Chris Helm, owner of Whitetail Fly Tieing Supplies in Toledo, Ohio, is at the end of this post. Tails: Six yellow or ginger Microfibetts, split 3/3; you can also use just three fibers and divide them with two thread wraps. This works on the pattern because of the floatation qualities of the Sexi-Floss. This fly can be tied with Danville No. 8 Yellow, or No. 61 Light Olive, for varying shades of this mayfly dun, Ephemerella invaria. The Sexi-Floss is tied in at the thorax area, after the tail is tied in. Then the Sexi-Floss is s-t-r-e-t-c-h-e-d and the tying thread is wound evenly over it back to the base of the tail, then forward again. This prevents the bulge that would develop if the Sexi-Floss would be tied in at the base of the tail. This also produces a nice two-layered thread under body, ensuring a good color and smoothness. Flattening your tying thread helps for a smoother body and better coverage. #14 Sulphur Sexi-Floss Parachute Dun. The ingredients are the same as the Sulphur Thorax Dun above, except that the hackle is wound counter-clockwise, parachute style, around the base of the wing post. Fly tied and photographed by Don Bastian. A parachute version of a mayfly presents a slightly lower floating profile on the water. I also tie a spent wing #14 Sulphur Spinner, using the Amber Sexi-Floss for the abdomen, and clear Enrico’s Sea Fibers and two strands of pearlescent Krystalflash in the wing. Sulphur orange rabbit dubbing, and three yellow Microfibetts complete the fly. Danville yellow or orange thread should be used. This pattern has been my “go-to” sulphur spinner on Spring Creek for a decade. Some people think the Spring Creek sulphur patterns need to be #16, but I’ve seen scores of them, in my hands. They’re a solid #14. That’s what I fish. #18 Blue Quill Sexi-Floss Thorax Dun, tied and photographed by Don Bastian. Make sure your three to four thread wraps are tight when you finish winding the Sexi-Floss at the thorax before you cut it off. One of my subscribers recently told me that the material can unravel after being trimmed. Of course it can. But that is a thread tension issue. I have tied more than 1,000 flies with Sexi-Floss abdomens, and I have never had a single body unravel on me. The main reason for this is likely the fact that as a former commercial tier, I hold my scissors in my hand; also, my hackle is always prepped and ready to tie in, so when I wind three tight wraps over the Sexi-Floss and trim it, I never let go of my bobbin. The trimmed hackle stem is held in place and tied in. On spinners where there is no hackle, I immediately begin applying dubbing, which I learned to do with my left hand, so again, I never let go of my bobbin. I also practice and firmly believe A. K. Best’s advice from his first book, Production Fly Tying: “Ninety-five percent of the time you are tying you should be working with the thread just under the breaking point.” I wrote that from memory, it might be a word or two off, but you get the gist of it. I like the natural body silhouette created by the slim abdomen and the built-up thorax created with the rabbit fur. The fur thorax also helps the hackle wind smoothly without twisting. These patterns are durable, and they catch fish! Chris Helm, owner of Whitetail Fly Tieing Supplies, in Toledo, Ohio, carries the Montana Fly Company Sexi-Floss in stock. He does mail-order, is very knowledgeable as a fly tier, and you may speak directly with him and place your order at: 419-843-2106. 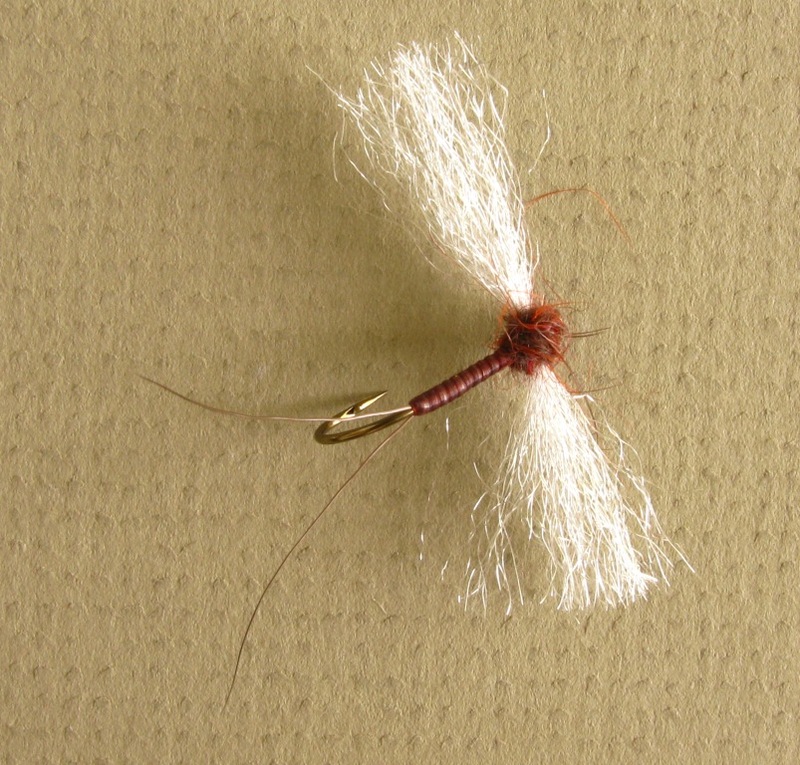 My March Brown Sexi-Floss Spinner was posted a year ago, but I thought I’d add that pattern here to provide yet another fly to display the versatility of Sexi-Floss. Tails: Two fibers of moose body hair; note how they are attached to the sides of the hook shank, not on top. This is accomplished by attaching them above the hook point, then placing your finger on top to move them to the sides of the hook as you wind to the end of the body. Remember that Sexi-Floss floats, thereby improving floatation for drys. If you try tying some of these patterns with Sexi-Floss, you won’t be disappointed! This entry was posted in Dry Flies, Fly Pattern Recipes and tagged Blue Quill Sexi-Floss Thorax Dun, Chris Helm, March Brown Sexi-Floss Spinner, Montana Fly Company, Sulphur Sexi-Floss Parachute Dun, Sulphur Sexi-Floss Thorax Dun, Whitetail Fly Tieing Supplies. Great post Donnie!!! I really like it and will have to give it a try. Great post. I have been using this material since 2001. I was the Fly-Tying Dept manager(?) who did all the ordering and stocking of materials for a fly shop in Boulder, CO. I have used this material for Mayflies, Caddis flies, in nymph forms, emergers and dries. I is also a great ribbing material for all types of nymphs. You should tie up some Yellow Sallys or small Green Stoneflies. Thanks for the comments! I checked out your blog posts with the patterns, they look good! I have also used this material as a ribbing, but not too much for bodies on nymphs. 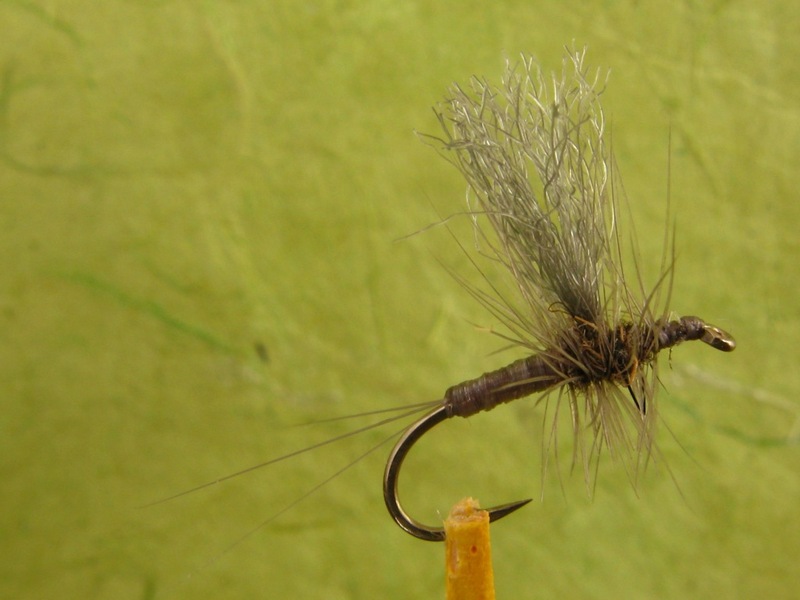 Most of my tying and experimentation has been on mayfly drys. I can see how the chartreuse and yellow Sexi-Floss would make great Yellow and Lime Sally stone fly drys, too. Thanks again for your comment!